Chaundra is a doctoral candidate in the Adult Education and Human Resource Development program at Florida International University. She has over 15 years teaching experience in literacy, vocational and corrections education. She spent 3 years teaching Adult Basic Education at a women’s prison and developed a passion for correctional education and justice issues. She is currently a Research Assistant for The Education Effect, a Florida International University school- community partnership where she is focused on data collection and evaluation. Her academic research interests are correctional education, adult education advocacy, adult basic education and conflict resolution. She has a comprehensive conference presentation and publication history. Her publications include work on the voices of incarcerated people, workforce readiness, mentoring, and corrections health education issues. She actively volunteers as a facilitator of the Alternatives to Violence Project in correctional facilities in South Florida. 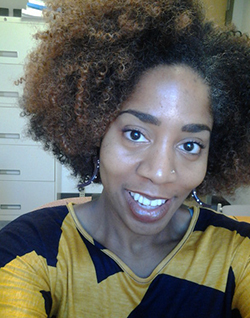 Chaundra lends her expertise to E-SToPP by providing support in research and networking. She has a MS in Adult Education from Florida International University and a BA from Florida A & M University, along with Graduate Certificates in Women’s Studies and Conflict Resolution & Consensus Building.